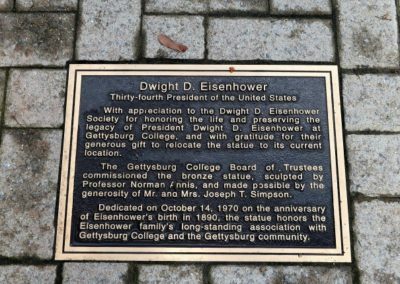 Each October, on the Saturday nearest to October 14th, the Eisenhower Society recognizes Eisenhower’s accomplishments. 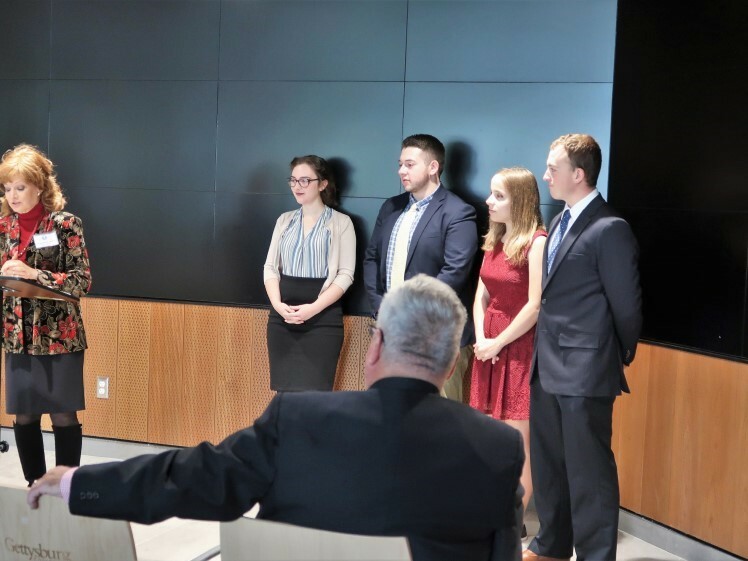 This commemoration gives us a chance to remember Eisenhower’s leadership as General and President and share that knowledge with others. A wreath laying at the Eisenhower statue on the Gettysburg College campus also provides an opportunity for the Society to present scholarships to Gettysburg College students. 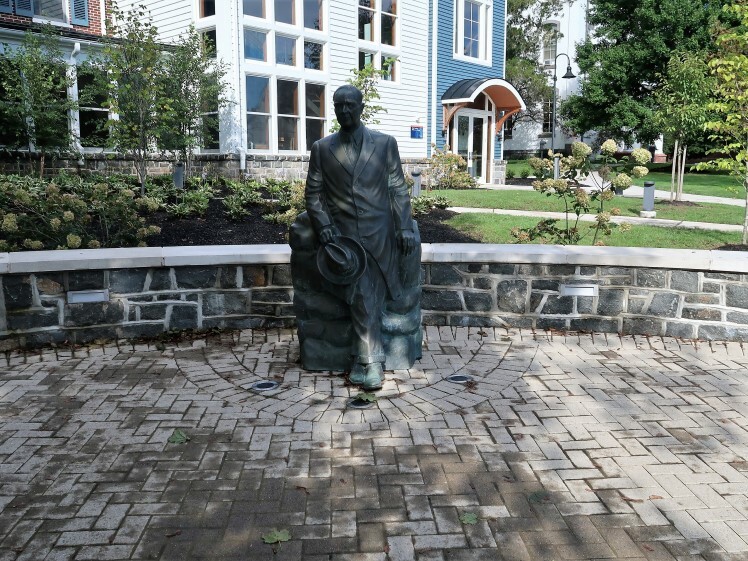 Afterward, attendees are welcome to the luncheon at the Dobbin House restaurant. The buffet style meal is followed by a presentation by a guest speaker. Each year we welcome an author or scholar to share an aspect of his or her knowledge about Eisenhower. For information on this year’s speaker, see the registration page. 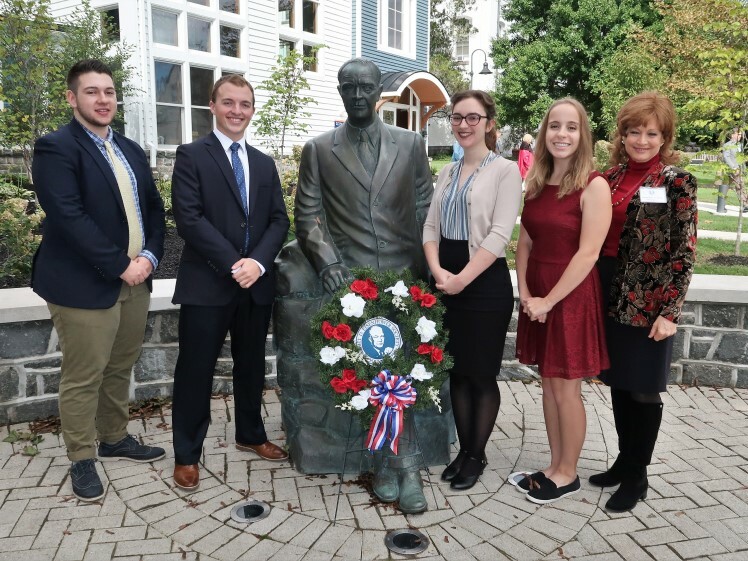 The Dwight D. Eisenhower Society commemorated Eisenhower’s birthday on Saturday, October 13, 2018. 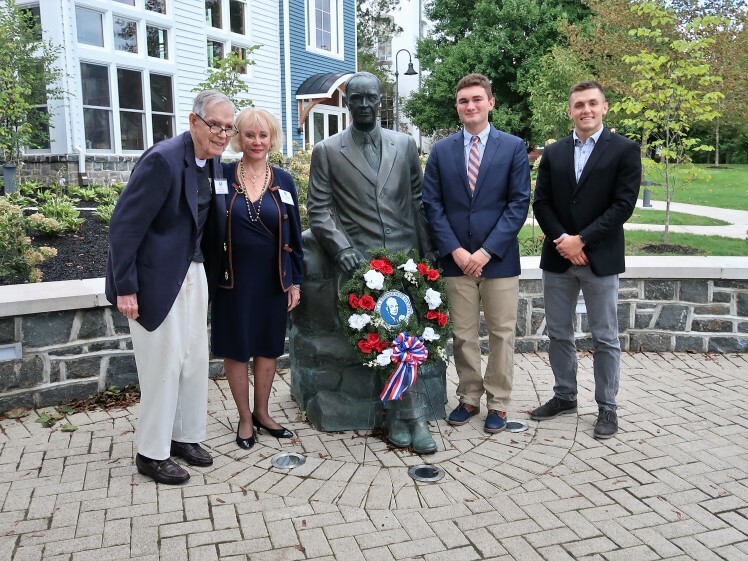 The program began at Gettysburg College where the Society sponsors an annual wreath laying outside Eisenhower’s post-presidential office. 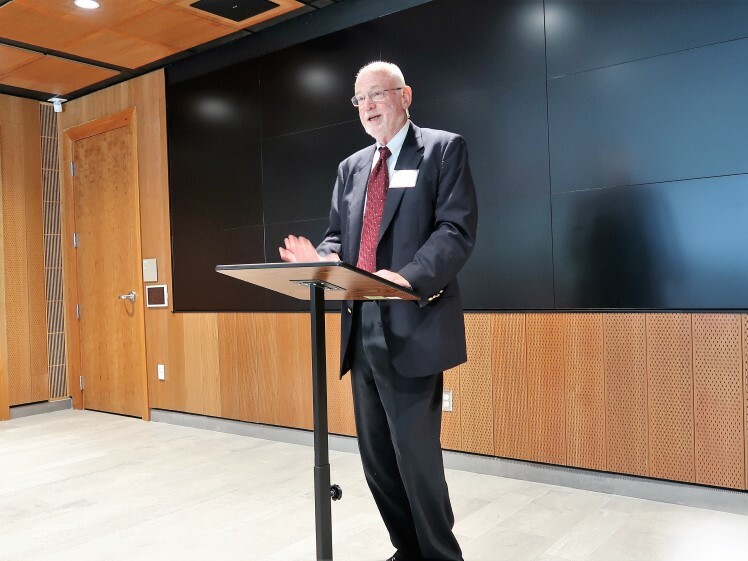 Due to the weather, most of the program was held inside the new auditorium addition to the Eisenhower House. 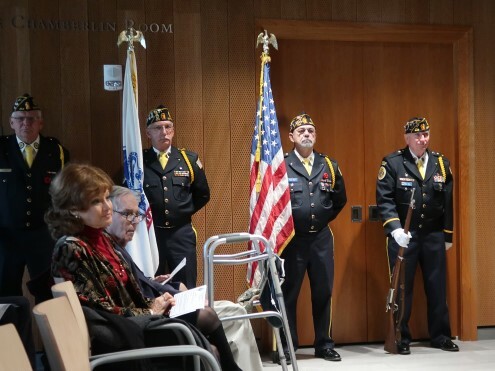 After the presentation of the colors by American Legion Post #202, readings from Eisenhower’s books, Mandate for Change and Waging Peace were read. Both books were written at Eisenhower’s College office. 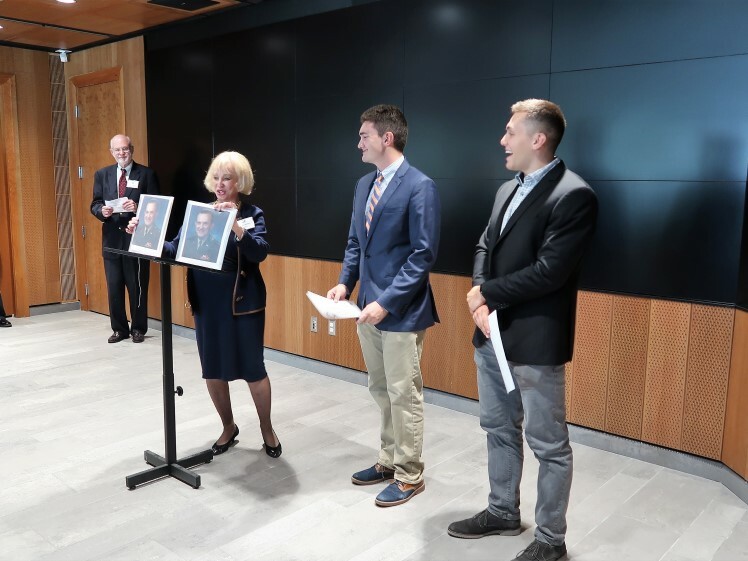 Eisenhower Society Trustee Mrs. Priscilla Roberts presented the Major General J. Milnor Roberts ROTC Award to two outstanding Gettysburg College ROTC students, and Society President Jacqueline White presented scholarships to four Gettysburg College students. 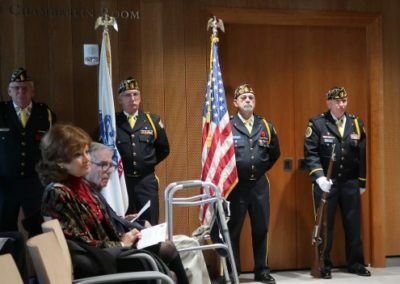 The program ended with the playing of Taps. Afterward photographs were taken outside by the Eisenhower statue. The group enjoyed a delicious lunch at the Dobbin House Tavern. 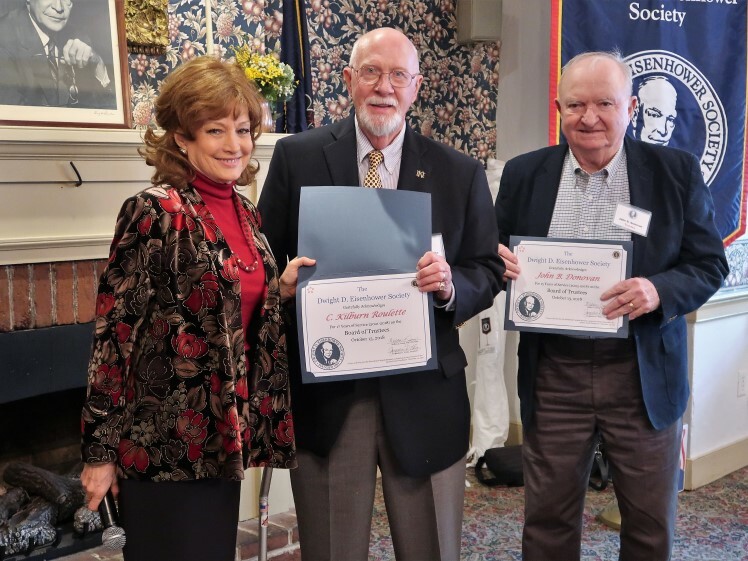 Jackie White thanked luncheon sponsors, Dr. William Aldrich, Lt. General Harry Soyster and Ms. Priscilla Roberts, recognized retiring board members John Donovan, C. Kilburn Roulette and Steven Gibble for their years of service, and led the audience in the singing of “Happy Birthday” for Society Chairman Brigadier General Samuel K. Lessey’s 95th birthday. 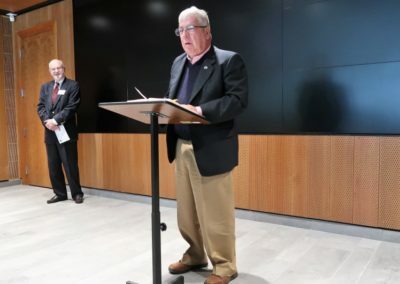 A quick review of the Society’s plans for the 50th anniversary year in 2019 followed. 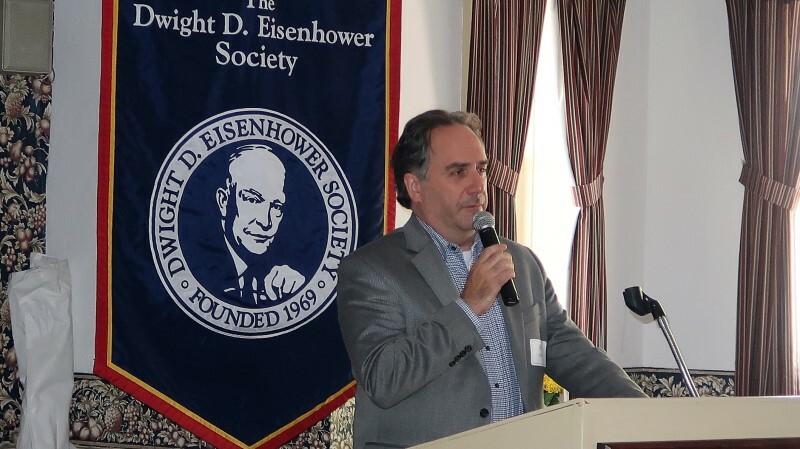 Then historian Dr. Edward Lengel shared stories about the Eisenhowers’ life in the White House. 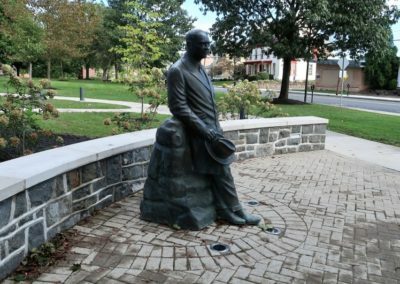 A fact surprising to many was that First Lady Mamie Eisenhower secured the donation of one of the five original copies of the Gettysburg Address for display at the White House! 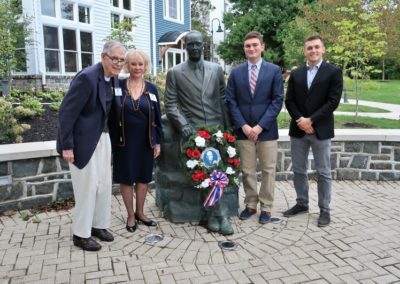 We look forward to Eisenhower’s birthday commemoration next year on Saturday, October 12, 2019. 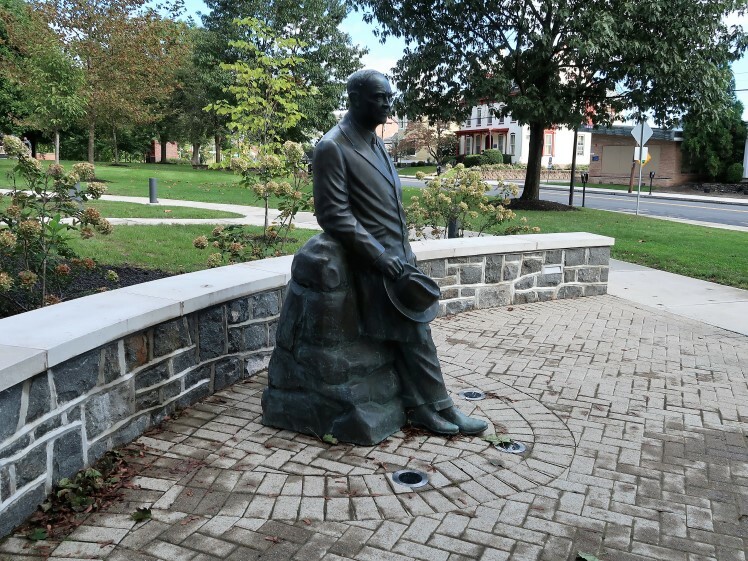 The Eisenhower Statue at its new location outside the Eisenhower House, Gettysburg College. 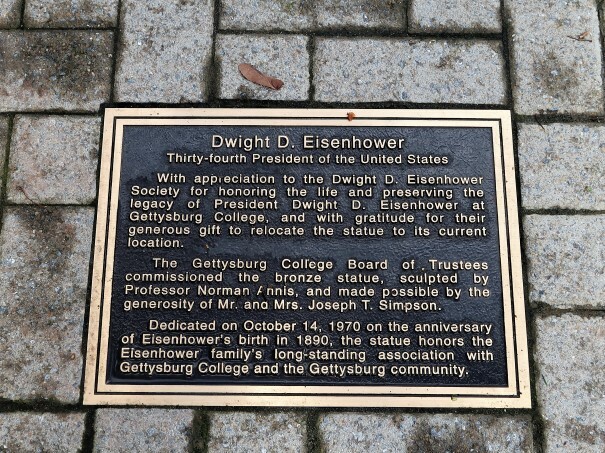 A plaque recognizes the Eisenhower Society’s work. Vice President Ton Ten Barge emcees the program. American Legion Post #202 posts the colors. Trustee Priscilla Roberts presents the Major Gen. J. Milnor Roberts Outstanding ROTC student award. President Jacqueline White presents the scholarship awardees. 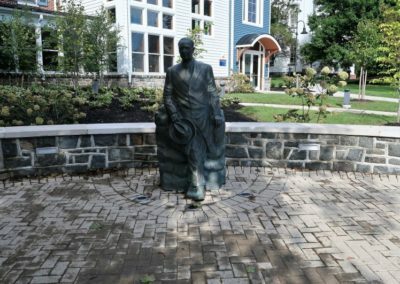 The Eisenhower Statue sculpted by Professor Norman Annis stands on its new plaza with landscaping. Brig. Gen Lessey and Priscilla Roberts pose with the outstanding ROTC awardees. 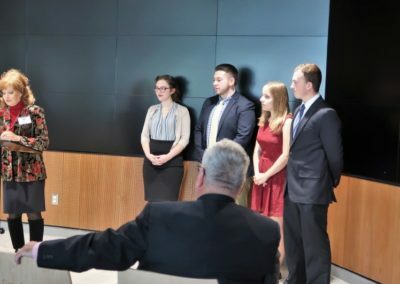 President Jackie White stands with the Eisenhower Society scholarship students. 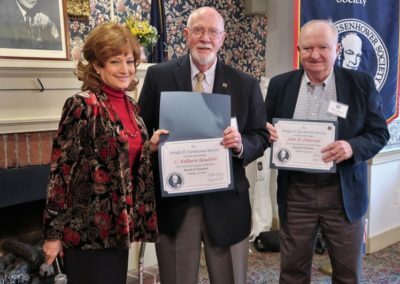 President Jackie White presents certificates of appreciation to retiring board members Kib Roulette and John Donovan. 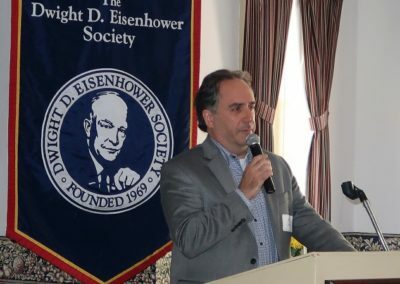 Dr. Ed Lengel shares stories of the Eisenhowers in the White House.